Hawk 87A-3/Kittyhawk IA, dipamerkan di Muzium Kebangsaan Tentera Udara Amerika Syarikat. Pasukan Udara Tentera Darat A.S.
Curtiss P-40 merupakan sebuah pesawat pejuang dan serangan darat berbadan logam, satu tempat duduk dan berenjin tunggal buatan Amerika Syarikat yang mula diterbangkan buat pertama kalinya pada tahun 1938. Ia digunakan oleh tentera udara di 28 buah negara, termasuk kebanyakkan Pasukan Berikat semasa Perang Dunia II, dan kekal berada di barisan hadapan sehingga penghujung perang. Pada November 1944, semasa pengeluaran P-40 ditamatkan, 13,738 buah pesawat ini telah dibina, kesemuanya di kemudahan kilang utama milik Curtiss-Wright Corporation di Buffalo, New York. Wikimedia Commons mempunyai media berkaitan: P-40 Warhawk. ^ Curtiss P-40 Warhawk. Variants: XP-40. Arena, Nino. Macchi 205 "Veltro" (in Italian). Modena: Stem Mucchi Editore, 1994. Boyne, Walter J. Clash of Titans. New York: Simon & Schuster, 1994. ISBN 0-671-79370-5. Boyne, Walter J. and Michael Fopp. Air Warfare: An International Encyclopedia. Santa Barbara, CA: ABC-CLIO, 2002. ISBN 1-57607-345-9. Crawford, Jerry L. Messerschmitt BF 110 Zerstörer in action. Carrollton, Texas: Squadron/Signal Publications, 1977. ISBN 0-89747-029-X. Dean, Francis H. America's Hundred Thousand. Atglen, PA: Schiffer Publishing Ltd., 1997. ISBN 0-7643-0072-5. Donald, David, ed. "Curtiss Model 81/87 (P-40 Warhawk)"Encyclopedia of World Aircraft. Etobicoke, ON: Prospero, 1997. ISBN 1-85605-375-X. Ford, Daniel. Flying Tigers: Claire Chennault and His American Volunteers, 1941-1942. Washington, DC: HarperCollins|Smithsonian Books, 2007. ISBN 0-06-124655-7. Ethell, Jeffrey L. and Joe Christy. P-40 Hawks at War. Shepperton, UK: Ian Allan Ltd., 1979. ISBN 0-7110-0983-X. Hardesty, Von. Red Phoenix: The Rise of Soviet Air Power 1941–1945. Washington, D.C.: Smithsonian Institution, 1982. ISBN 0-87474-510-1. Horn, Alex. Wings Over the Pacific: The RNZAF in the Pacific Air War. Auckland, NZ: Random House New Zealand, 1992. ISBN 1-86941-152-8. Lavigne, J.P.A. Michel and James F. Edwards. Kittyhawk Pilot. Battleford, Saskatchewan: Turner-Warwick, 1983. ISBN 0-919899-10-2. Mellinger, George. Soviet Lend-Lease Fighter Aces of World War 2 (Osprey Aircraft of the Aces No. 74). Oxford, UK: Osprey Publishing, 2006. ISBN 1-84603-041-2. Molesworth, Carl. P-40 Warhawk Aces of the CBI(Osprey Aircraft of the Aces No. 35). Oxford, UK: Osprey Publishing, 2000. ISBN 1-84176-079-X. Müller, Rolf-Dieter. Der Bombenkrieg 1939 – 1945 (in German). Berlin: Links Verlag, 2004. ISBN 3-86153-317-0. Neulen, Hans Werner. In the Skies of Europe: Air Forces Allied to the Luftwaffe, 1939–1945. Ramsbury, Marlborough, UK: The Crowood Press, 2005. ISBN 1-86126-799-1. Pentland, Geoffrey. The P-40 Kittyhawk in Service. Melbourne, Victoria, Australia: Kookaburra Technical Publications Pty. Ltd., 1974. ISBN 0-85880-012-8. Rudge, Chris. Air-To-Air: The Story Behind the Air-to-Air Combat Claims of the RNZAF. Lyttleton, Canterbury, New Zealand: Adventure Air, 2003. ISBN 0-473-09724-9. Scutts, Jerry. Bf 109 Aces of North Africa and the Mediterranean. London: Osprey Publishing, 1994. ISBN 1-85532-448-2. Shamburger, Page and Joe Christy. The Curtiss Hawk Fighters. New York: Sports Car Press Ltd., 1971. ISBN 0-87122-041-0. Shores, Christopher and Hans Ring. Fighters over the Desert. London: Neville Spearman Limited, 1969. ISBN 0-668-02070-9. Shores, Christopher and Clive Williams. Aces High: A Further Tribute to the Most Notable Fighter Pilots of the British and Commonwealth Air Forces in WWII, v. 2. London: Grub Street, 1994. ISBN 1-898697-00-0. 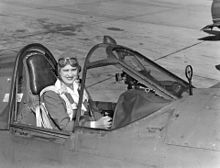 Jackie Cochran in the cockpit of a P-40 fighter plane, she was head of the Women Airforce Service Pilots (WASP). Laman ini diubah buat kali terakhir pada 05:56, 26 Januari 2015.